Jim is a Bay Area native and the proud father of four amazing kids. He grew up in Marin County and graduated from the University of California at Santa Barbara. He has loved camp since he first attended day camp back in the 3rd grade. Since then, he has been involved in a wide range of youth development activities as a volunteer, coach, parent and leader. He is very excited to be part of the Mountain Camp Woodside team. Jim has been part of the Mountain Camp family since 1999. 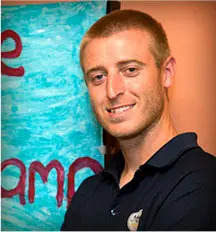 As the Camp Director, he is responsible for the camp marketing, new program development, staff hiring and the overall administration of the camp. He works year round to ensure that the summers at Mountain Camp Woodside are filled with fun, friendship and wonderful lifelong experiences. 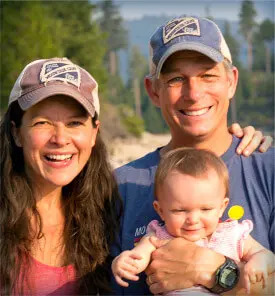 When he is not working on camp stuff, Jim dotes on his beautiful wife Cheryl, and their four incredible children: Kylie, Devon, Nicholas and Jace. Amy first experienced camp in 2010 when she left ‘sunny’ Wales to come over for the summer to be a camp counselor. Not only did she have the summer of her life, making lifelong friends and incredible memories, she also left having met the man who would later become her husband. 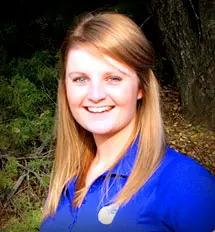 Amy moved to California in 2013 after graduating from Swansea University and working as a Paramedic for the Welsh Ambulance Service. When she isn’t in the camp office she likes to go to the beach, go for hikes and play with her adorable dog “Mal.” Amy can’t wait for another amazing summer and is excited to see all of the friendships and confidence the campers will leave camp with. She is also excited to join in with all of the silly camp games and songs….You can’t ride on my little red wagon! Mike started working at Mountain Camp Woodside in 2005 and loves coming back each summer. He graduated from Tennessee Tech University with a degree in Education. When he is not at camp, Mike spends his time coaching, tutoring, playing sports and traveling. He recently was working in Thailand, teaching English for the US Embassy. Although he is from Nashville, TN, he can’t sing country music but loves singing camp songs off-key. Don first began working for Mountain Camp in 1993 and currently oversees all year-round operations. He is a proud graduate of UCLA and formerly directed Bruin Woods, the UCLA Alumni Family Camp on Lake Arrowhead. 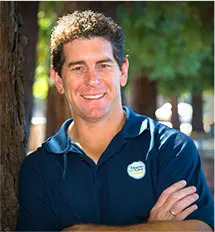 Don is very active in the camp profession and currently serves on the National Board of Directors for the American Camp Association and is the Past President and Vice President of the Western Association of Independent Camps. When they are not at camp, they live in San Francisco and you’ll find them outside with their dog Bo running at Ocean Beach, hiking around Marin, surfing wherever the waves are small and exploring our beautiful Bay Area. Our counselors come from all over the world to spend their summer working at Mountain Camp Woodside. Click here to meet this years team – you might even spot a few familiar faces! Mountain Camp Wodside has caring and kind staff. I trust them to take good care of my son for the day. The staff are also enthusiastic, energetic, and very motivated to giving children an enriching and fun camp experience! My son has been at day camp at Mountain Camp Woodside for two years in a row and loves it! - Nick D.